The term "classical music" generally refers to music written for a group of musicians who play orchestral instruments: strings (such as violins and cellos), woodwinds (such as flutes and clarinets), brass (such as trumpets and French horns), and percussion (such as the timpani, or kettledrums). Most orchestral music is written in one of two forms: a symphony or a concerto. A symphony is a major work, played by the entire orchestra. Most symphonies have two or more parts, called "movements." Some of the best-known classical symphonies have four movements: the first is fast; the second is slow; the third is music for a dance, such as a minuet; and the last movement, or the finale, is fast. A concerto is a musical composition performed by the orchestra and a soloist - who play in dialogue with one another. Most concertos have three movements. During the performance, there is a short, silent pause between each movement of a piece. You can determine how many movements there are in a piece, and how many silent pauses there will be, by looking at your program - the movements in each piece will be listed there. Applause is usually reserved for the end of the final movement of the piece, after the conductor has signaled the end of the final note with his or her baton or hand. The 106 members of the New York Philharmonic all earn their living as full-time musicians. They rehearse and perform with the Orchestra at David Geffen Hall during the regular season (September to June), play free summer concerts in New York-area public parks, and tour throughout the United States and the world. The Orchestra is also heard on New York Philharmonic recordings, and on live national television and radio broadcasts. Will I recognize the music? It is very likely that you will recognize parts of many symphonies, concertos and choral works (classical music performed by an orchestra, vocal soloist, or choir). Music written by the great classical composers is often used in movie soundtracks, television shows, and commercials. No. One of the great joys of going to a New York Philharmonic concert is being introduced to a great piece of music you've never heard before, or listening to a superb performance of a piece you haven't heard in years. Some regular concert-goers do find they appreciate the performance more if they listen to a recording of the piece before the concert, so they can better anticipate their favorite parts, or listen for virtuoso playing of the more difficult passages. And many audience members find it enhances their enjoyment of the music if they take the time before the performance to read the notes in the program about the composer and the pieces that are to be played. On the Philharmonic website, we post each concert's Program Notes two weeks before the performance. Most people consider a concert by the New York Philharmonic to be a special event, and tend to dress for the occasion - in suits and ties, or "nice" dresses or pantsuits. Many people come to the concerts from work, and are dressed in professional business attire. Formal dress - evening gowns and tuxedos - are generally worn only to gala New York Philharmonic events, such as Opening Night or New Year's Eve concerts. Yes, cell phones and cameras are allowed. However, we require that you turn off all cell phones, cameras, pagers, beeping watches, and other electronic devices before the performance begins—and that you check to see that they are again turned off after intermission, before the second half of the performance begins. Audience members may take photographs before and after the concert, as well as during intermission and applause. Please note, however, that no photography or recording of any kind is permitted during the performance. Anyone seen using a camera, smart phone, or other device for these activities will be asked to leave. Can you give me directions to David Geffen Hall? Lincoln Center is located in Manhattan on Broadway, between West 62nd and West 65th Streets. 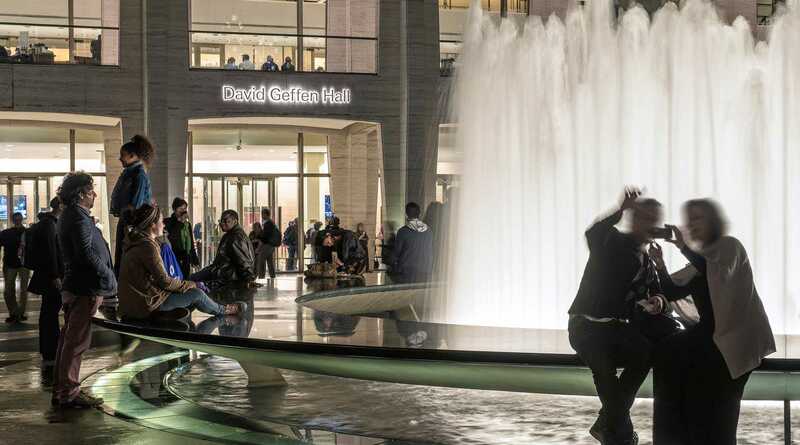 David Geffen Hall is at Broadway and West 65th Street, with main entrances on the north side of the main Lincoln Center plaza, facing the fountain. The M5, M7, M10, M11, M66, and M104 bus lines all stop within one block of Lincoln Center. For additional bus and subway information and directions, call the Travel Information Bureau at (718) 330-1234, 24 hours a day, or visit www.mta.info online. Tickets may be purchased in person, by mail, telephone, or online. For ticket availability only, call (212) 875-5656. Where can I go before or after the concert? David Geffen Hall, part of Lincoln Center for the Performing Arts, is the home of the New York Philharmonic; it is a world-renowned venue and an excellent setting for your introduction to classical music. David Geffen Hall is comprised of Orchestra, First, Second and Third Tier seating at a wide variety of prices. When you purchase tickets online or in person, you can view a seating chart to find the location of your seats. We suggest you arrive 20 to 30 minutes before the concert is scheduled to begin. That will give you ample time to find your seat, relax, read the Program Notes, and watch the musicians as they take the stage. New York Philharmonic concerts begin promptly at the announced starting time. Ticketholders who come late will not be seated in the hall until after the conclusion of the first work on the program. Concertgoers who must leave the hall before or during the playing of a piece will not be reseated until after that piece is concluded. In consideration of the performers and fellow concertgoers, we ask that you remain in your seat until the concert has ended. There are two reasons to applaud at a New York Philharmonic concert: as a greeting, and to show appreciation. Just before the concert begins, the Orchestra members will all be seated on the stage, except for the Concertmaster - the violinist who sits in the first chair of the first row of the Orchestra. You applaud to greet the Concertmaster when he or she comes onstage. You applaud again a few moments later when the Conductor comes onstage. Any soloists who will be performing will usually come onstage with the Conductor; you applaud to greet the soloist or soloists as well. You do not applaud again until the end of each piece of music, to show your appreciation to the performers. Some longer pieces may have several sections, or movements, separated by a brief, silent pause. The audience does not applaud between movements of a piece. The program will list the movements in each piece, so you will know how many there are; applause is usually reserved for the end of the last movement. The Program Notes for each concert are posted on the New York Philharmonic website, two weeks before the concert date. These notes will have information about the composer and the piece to be played. Audio samples are also available for selected works in the concert calendar. 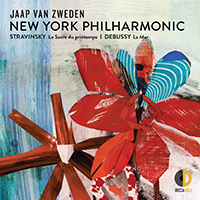 A number of the classical compositions that will be performed during our season are available on CD. Kids of all ages will enjoy learning about the orchestra in our interactive Kidzone. We can also add you to our New York Philharmonic mailing list to keep you up-to-date on all Orchestra events and activities. Simply log in or sign up for this free benefit. What is your policy on bringing young children? Children 4 years old and younger are only permitted at our Young People’s and Very Young People’s concert series.